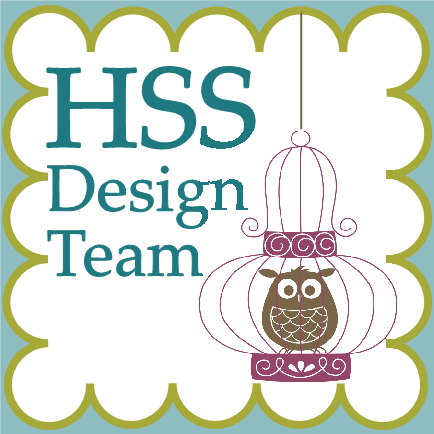 This week at Hand Stamped Sentiments we have a hearts theme challenge. Hearts are a wonderful shape because they’re not just for Valentine’s day. They fit right it for birthdays, anniversaries, thinking of you, weddings and thank you projects. I knew I wanted to create a project with spring colors and with a shabby chic look. I’ve recently downloaded the Spring Vintage DSP for My Digital Studio and I thought perfect! Next I selected the perfect coordinating stamp sets, Baby Blossoms and With all my Heart. The box shape I selected is the Petal Cone. The shape is perfect for my vintage shabby chic look I had in mind. 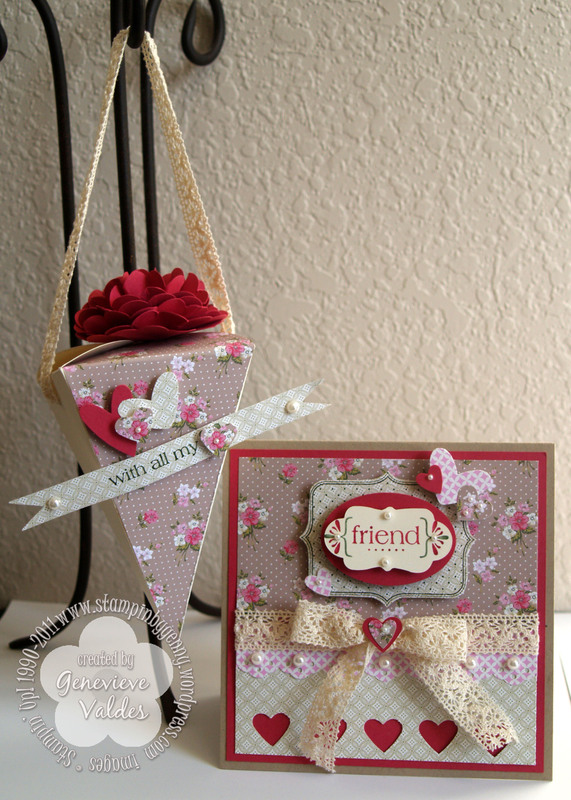 The Petal Cone die, Spring Vintage DSP and Baby Blossoms stamp set can be found in the new Occasion Mini. To add to my spring shabby chic look I embellished with pearls, crochet trim and of course hearts. The base of the card is Crumb Cake CS, the next layer is Rose Red CS. The DSP is the Spring Vintage download printed on matte photo paper. I created the sentiment layer on my card by stamping the frame from the Baby Blossoms stamp set then used paper snips to cut the frame. 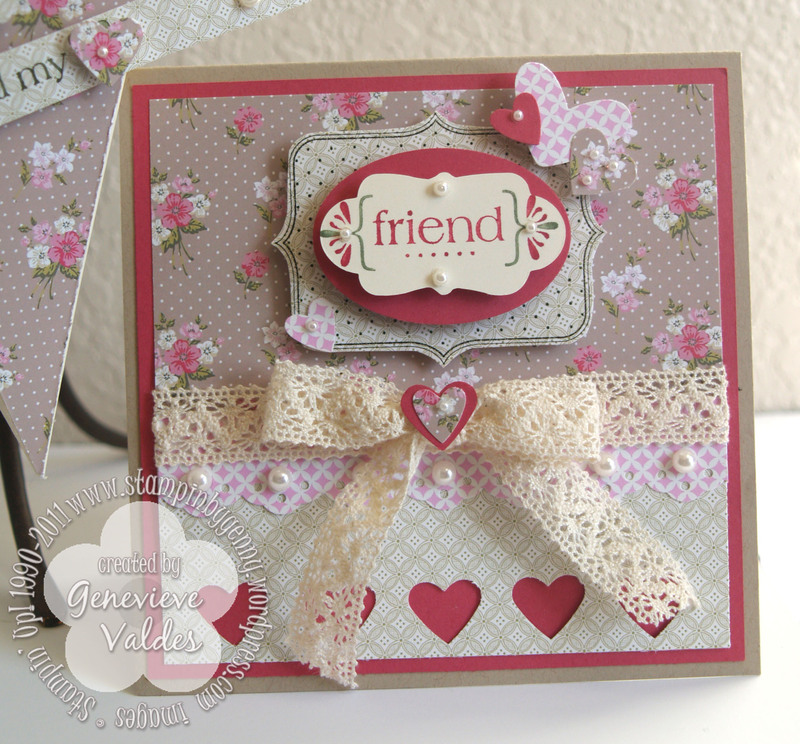 I used the SU wide oval punch and then used a tag from the Matchbox die and stamped ‘friend’ from With all my Heart stamp set. I also used the Eyelet border punch under the crochet ribbon and embellished with pearls. I created the heart trim at the bottom of the card using the Small heart punch. I aligned the side of the punch with the previous heart and aligned the bottom of the heart with the line I drew in pencil. Draw it light so it can be erased once you finish. 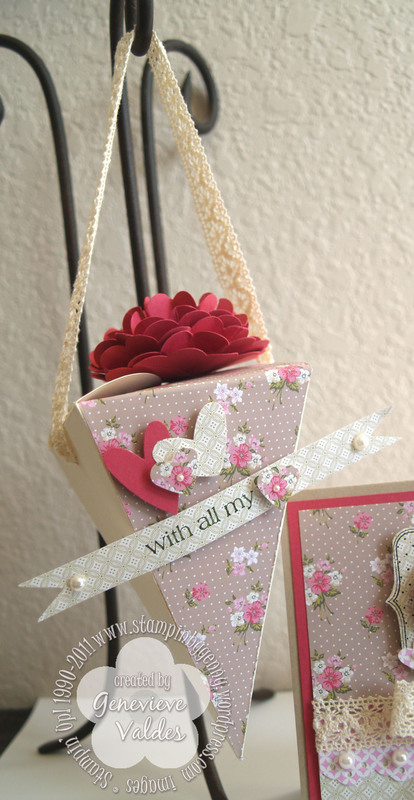 The Petal Cone box is Very Vanilla CS and I then printed Spring Vintage DSP on matte paper then put the paper through my Big Shot with Petal Cone die so I could then cut two sides of the triangle. I cut these out then adhered them to the sides of the Petal Cone. The Scallop flower is made with the 2-3/8″ scallop circle punch and clear rhinestone brad. This is my quick and fast method for making the scallop flower. Punch 6 scallop circles, stack them all together, then pierce the center and use a brad to fasten. Crunch and fold each layer. Voilá you have a flower. There are other methods where you fold each layer and spritz with water before fastening all the layers but I don’t have much patience and my quick method works for me. I enjoyed making this gift set and I hope it inspires you to take the challenge and create your heart project. Petal Cone Accessories: Small heart punch, Heart to Heart punch, 2-3/8″ Scallop punch, Big Shot, Petal Cone die, 5/8″ Victoria Crochet Trim ribbon, Basic Pearls, clear rhinestone brad for scallop flower. Absolutely, gorgeous! You really did hit the vintage feel with just everything about this card. Beautiful! Love the card and cone. Really great job. Love it! Hope I find time before V-day to try some of these ideas (as well as the previous post – love the bird one). This set is lovely. I love the layout, colors and all the flowers. Each of the elements of your card came together beautifully. I hadn’t ordered that DP, but I may have to after seeing your card.